We have been receiving a lot of questions since the FDA recently released an advisory regarding flea products such asNexgardandBravecto. This class of drugs is known as the Isoxazoline group of medications and has an overall very wide safety margin. This is one of the main reasons why we recommend these medications. The warning that was released was in regard to rare adverse events that are associated with neurologic signs – seizures, tremors, etc. This has received a lot of press coverage but please be aware the press coverage is far and above what the overall incidence of these adverse events are. We have been prescribing these medications for 4 1/2 years and have had thousands of dogs under our care on these medications. From our recollection, there have not been any pets that have had any of the major adverse events as described above.Please be aware, these are rare reactions. The manufacturers of these medications are required to keep safety data and log any reported adverse events. From the makers of Nexgard, they report the most common adverse events are vomiting, pruritus, lethargy, and diarrhea. These events are exceedingly rare at <1 case/10,000 doses. They report that neurologic events are even more rare than that. If a pet does have one of the reactions listed above, the outcome is typically mild and not life threatening. The only change would be to not give this class of medication again and to use anext-gen topicalflea medication. 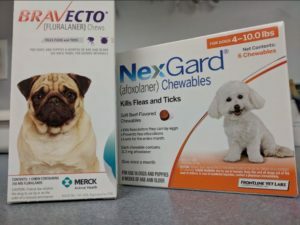 If your pet has been on Nexgard, Bravecto, or Credelio and not shown any adverse effects, they are and will continue to be fine on these medications. We are continuing to give our own pets these medications on a monthly basis with no hesitation.